" ...Vicky immersed herself in our industry. She has a very creative approach and great passion for her work. " By the time I was 27, I was in my first board level marketing role. Before I was 30, I managed a portfolio of luxury hotel brands in Europe, the Americas and the Middle East but, by the time I was 41, I had started my own marketing and management consultancy company. What caused me, like many of my peers, to change direction and choose a career path outside of the corporate structure I had initially thrived within? It wasn't really the "glass ceiling". In fact, when mentoring young women considering a career in our industry, I emphasise the possibilities of fast promotion for those with talent who are prepared to work hard. There were some significant external influences during the early part of my career like 9.11 and the '08 recession, but the biggest impact, I believe, came from leadership and the culture it created. I was lucky enough to start my career working for some inspirational leaders who nurtured talent and recognised the value of innovation but, when external factors impact trading, the common response is to strip out cost and reduce investment in team training and recognition in an attempt to meet short term financial goals. Without a clear, long term strategy for growth and strong leadership, the vicious circle of "cut your way to the bottom" all too quickly becomes a norm. Peter Borg-Neal of Oakman Inns does not believe in this approach but then, his pubs also achieve the seemingly impossible: delivering authentic coffee shop, grill restaurant, local pub and vibrant night spot experiences, all in the same space, through careful design, zoning and excellent service. His company delivered a 36% YoY growth last year. Giving his views on, "Leadership in uncertain times" at Casual Dining 2019, he stated that nothing can be achieved without first engaging people and that, far from being an obstacle to success, high performing teams often do best in difficult times when they operate with a sense of shared purpose. "They pay you to write what we've already told them!" Working as a consultant, I frequently hear frustration from the teams I work with who feel that their leaders are not listening. 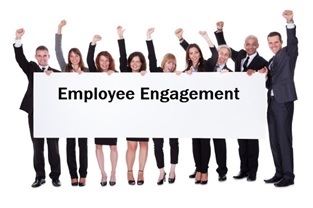 Conversely, when running employee engagement workshops, I hear team members say that their proudest career moment was being recognised at a company awards ceremony or that they are most motivated by a manager who asks their opinion on a work issue, especially when it is outside of their normal role. I read an article last year in BA Business Life suggesting that, to be successful, companies should invest in employee satisfaction rather than customer satisfaction. Apparently, depending upon which studies you read, between 40-70% of the average work force is "agnostic" and just turns up, 10-20% is actively disengaged and less than 20% is actually classed as engaged or loyal. Logically, the same article proposed that if you "move the needle on engagement, you move the needle on business performance". "People are now the primary source of competitive advantage...."
The people who work for us know our customers and see what we do well or badly. As consumers, they know what good service feels like. We just have to give them a voice. Build an environment of trust, where face to face conversations happen daily. Take time, ask questions and listen to the answers. Give teams the tools to solve problems for themselves and the confidence to make mistakes. Baby Boomers, hard wired with a natural respect of authority, can find it harder to challenge their leaders. Millennials and Gen Z have no such compunction! Neither will they think twice about leaving a company that does not value their input or deliver on its promises. According to the 2016 BNP Paribas Global Entrepreneur Report, Millennials (or Millennipreneurs) are already starting more businesses, earlier and with better financial results than their parents' generation. So, while there is still a role for consultants and bringing fresh eyes to help solve a challenge, if we don't start valuing our existing employees there will be no one left on the inside! Our industry is not just facing recruitment challenges but is involved in a "war for talent"! Isn't it time we started listening?